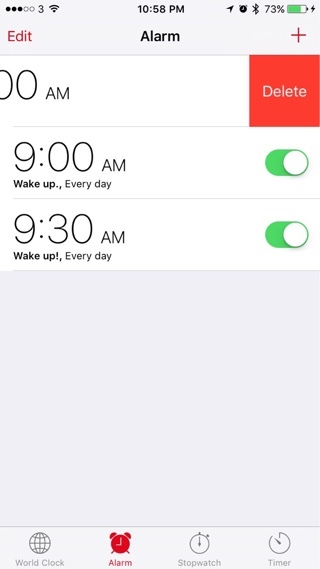 All of us use the stock Clock app of iOS to set our daily alarms. The app has been pretty reliable over the years and has maintained its usefulness after every iOS update. Although the app is quite well designed there’s one thing that has always been annoying many iOS users, and that thing is its lack of ability of allowing users to delete alarms by swiping on the screen. Until iOS 8, in order to delete an alarm entry you had to go into the editing mode by tapping on the ‘Edit’ button. Then you had to tap on the red ‘-‘ button, after which the ‘Delete’ button would appear. In iOS 9 Apple has finally made the process of deleting alarms easier by adding the swipe to delete gesture. Now in order to delete an alarm all you have to do is swipe left on any alarm entry and then tap on the ‘Delete’ button.